by Betsy: Infinitely Bossy 8's! I've been having fun with Helen William's 8s patterns. The Double 8's caught my eye and I thought I'd go with that. But somehow they turned into quadruple 8s :) When that happened, they reminded me of Margaret Bremner's Boss pattern, so I filled them in that way. Then I added a touch of Infinity. So (of course!) it became Infinitely Bossy 8's! My square Handbook journal is easier to draw in than most of my journals, probably because of the square page and smaller size, however it's still not as easy as a square tile. I do really enjoy it though. If you've been watching the Zentangle Mosaic app, you've seen lots of "graydations" or shades of gray. I'm a little late to the party, but this one certainly qualifies! 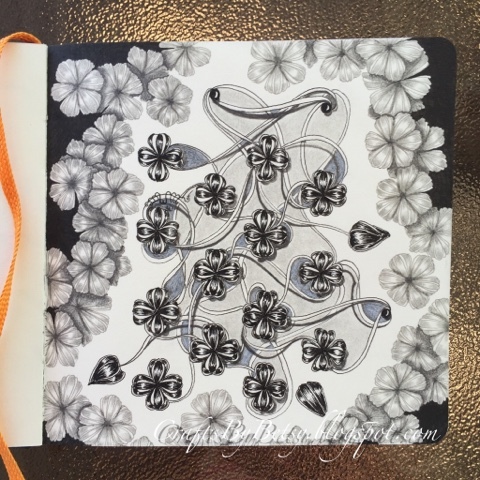 In addition to my black micron and graphite pencils, I also used a Derwent Graphik Line Maker 0.1 pen (graphite color) to outline the gray flowers. That way the outlines didn't smudge away when I blended the graphite pencil. I started to fill in the center area with the graphik pen, but found it too dark and blotchy, so switched to pencil. I also added some white pencil over the dark gray ink. Absolutely gorgeous! Very expressive with all shades of grey. A little piece of art!